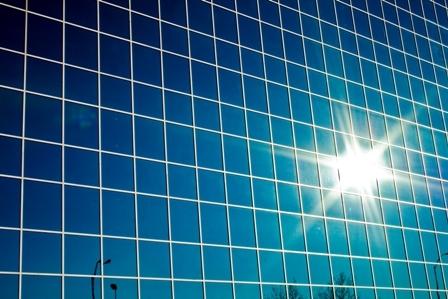 We publish our free quarterly research bulletin VISTA today. You can download a copy from the VISTA pages on this blog but here’s a taster from the current Issue for those of you who may not otherwise see it. 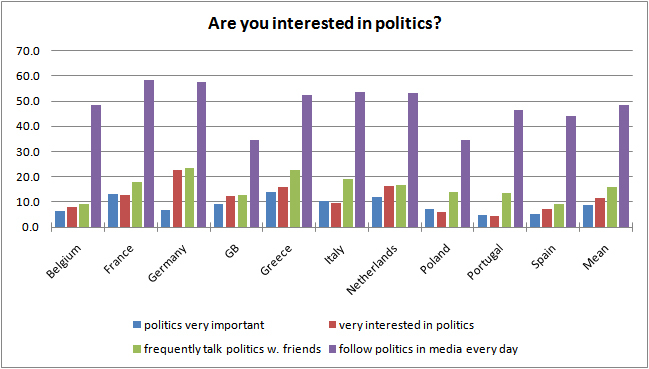 ARE EUROPEANS REALLY INTERESTED IN POLITICS? If you ask an average European* whether politics is important in their lives more than half of them will say that it is not. However a closer look at the European Values Study data suggests a more complex picture. We have focussed in on three aspects, the importance of politics to today’s Europeans, active involvement in political parties and their confidence in political institutions. Only 9% of Europeans say that politics is very important in their lives with 60% saying that politics is not, or not at all important to them. The most politically disengaged are the Portuguese and the Spanish with only 4.7% and 5.2% saying that politics is important, whereas 14% of Greeks say so. Further questions asking how interested they are in politics and how often they discuss political matters with their friends suggest similar levels of disinterest. However, when asked how often they followed politics on TV, radio or in the papers a surprising contrast emerged. In every one of the countries the level of political engagement through the media was significantly higher with almost 50% following political matters on a daily basis. Given that so few say that politics is important to them, it is perhaps no surprise that the percentage of those who say they belong to a political party is also very low. Overall just under 4% of Europeans belong to a political party or group but in some countries the percentage is much lower than that, only 2% in GB and Spain and 1% in Poland. Only in the Netherlands is there a notably higher level of political engagement by belonging with nearly 12% saying that they belong to a political party. The third measure of political engagement we considered relates to the confidence in political institutions, namely the parliament, government, and political parties in the countries in question, and the EU. Overall the political institution that enjoys the greatest confidence of Europeans is the EU with 7.5% of Europeans saying they are very confident about it. This is followed by their own Parliament (3,9%), their government (2.8%) and finally the political parties themselves (1.4%). As Figure 3 clearly shows however, there are significant national variations with Germany, GB and the Netherlands being much more euroskeptic, and Spain, Portugal, Poland and Italy ranking the EU as much more trustworthy than their national parliaments. Tellingly in no country does confidence in political parties rise above 3%. It is clear that Europeans are largely disengaged from politics when it comes to active participation in political parties or even political debate over coffee with their friends. Nevertheless, they are avid consumers of political matters in the media which may evidence a keen self-interest if nothing else. The crisis of confidence that political institutions are suffering is perhaps most clearly illustrated by comparison with levels of confidence in the church, another widely questioned institution. In every country but Belgium the church enjoys much more confidence than political institutions. Europeans appear to have more faith in faith than in politics. europeanmission is to carry summary versions of press releases written by William Yoder, working among the evangelical commmunity in Russia. This is the first such piece from William Yoder and we are glad to be able to offer this service. — On the 15th March, approximately 200 religious and secular leaders gathered in Moscow’s exclusive “President-Hotel” for the 11th Russian National Prayer Breakfast (established 1995). This year’s gathering, which was entitled “Russia – a Multi-National and Multi-Cultural Country”, was marked by Nikolay Svanidze’s impassioned call for Russian society to address the crying social and economic needs of its young. Svanidze, a prominent TV journalist and head of the state-run “Commission of the Public Chambre for Multi-National Relations and Freedom of Conscience”, decried the aggressive, xenophobic nationalism increasingly prominent among the nation’s young. Millions of youth are suffering from “poverty, crudity, violence and unjust courts and are seeking a release for their aggressive emotions”. He described the state’s propaganda for the young as promoting xenophobia and being “majestically-superfluous and nationalistic in character”. Svanidze noted that Russia’s “patriotic” societies and media have described the earthquakes in Japan as just “punishment for encroaching upon our rights to the Kuril Islands” just off the Japanese coast. This is an expression of our total lack of pity for the needy of Japan and elsewhere. He branded this inhumane reaction “a result of our moral isolationism, a post-imperial syndrome”. He consequently appealed for a “national programme teaching respect for one another, something almost completely absent from our country”. “Social escalator” programmes could instil in the young a sense of hope for the future. Russians too must learn that all of us are first-of-all simply human beings without ethnic or confessional boundaries. Alexander Torshin, First Vice-Chairman of the Council of the Russian Federation (Upper House), explained the traditional Russian aversion to the term “tolerance”. Along with the positive connotations of friendship and mutual respect, it is to the Russian mind also associated with undue acceptance of “injustice, crudity and lack of culture”. Tolerance can mean, in English terms, that “anything goes”. Some church leaders expressed concern that they were unable to make any contribution to the event. The Russian Prayer Breakfast has traditionally been a forum largely for the self-presentation of Protestant churches and organisations. So this year’s format, in which the lectures and greetings were limited to politicians as well as one Catholic, Muslim and Jewish representative, was a significant remake. Thanks to its brand-new format, this smaller and briefer Prayer Breakfast was not without hiccups. In a vast departure from Russian tradition, the audience usually did not rise from their tables for prayer. The prayers from the Catholic, Jewish and Muslim speakers seemed to be more read than prayed. Alexander Torshin, a veteran participant at Washington’s National Prayer Breakfast, explained in his short speech the intended future direction of the Russian movement. In agreement with the North American model, the Russian event is intended to become more of a presentation from and for politicians – not clergy. That is something quite different from the past Protestant event attended by a few politicians. Torshin regards Russian politicians publically testifying of their personal faith to be a distant dream, but he does believe that prayer gatherings will begin to take place within the Russian Duma and Parliament in the coming months. Criticism of the Breakfast’s new format centers on the fear that the event may not remain explicitly Christian. Evgeny Bakhmutsky, Senior Vice-President of the “Russian Union of Evangelical Christians-Baptists”, stated in an interview that he missed Christ-centered praying among the Protestant speakers. For the first time in years, not a single Orthodox cleric was visible at the event. The Moscow Patriarchate explains increasingly that the Prayer Breakfast’s format does not sync with Orthodox convictions. In the Orthodox tradition, public prayers need to be prayed by Orthodox clergy, and joint prayer with non-Orthodox Christians is now discouraged. Consequently, the Orthodox are championing their own inter-confessional forum. Its first public sessions may take place as early as Fall 2011. However, Russia’s National Prayer Breakfast movement is far from dead. A similar Breakfast was held in St. Petersburg on 20 March; another will take place in Krasnoyarsk/Siberia in April. 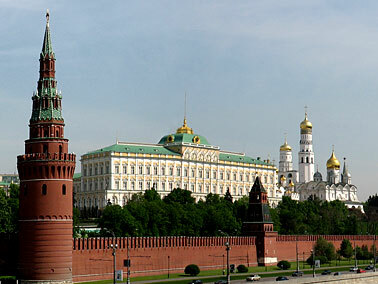 Next year’s Moscow event is scheduled for 13 March.